Scientists in Germany reached a major milestone when, after around 19 years in development and 1.2 billion Eutos spent, the Wendelstein 7-X created hydrogen plasma. It’s one big step closer to a fusion power plant, but it got me thinking. Why are we doing this? Maybe 19 years ago it mad sense, but these days, solar energy production has dropped in price to the point where it’s nearly cost competitive with fossil fuels already. Fusion is still many years awat before a large scale design can even be considered, let alone built. Solar is a clean energy solution that is ready to implement now. Instead of sinking billions of dollars into fusion (the reactor in Germany is just one of many being built), we should invest that money in building large scale solar energy power plants instead. Ah, but if we did that, what would happen? With the economies of scale, prices of solar panels would drop even further. More people would opt to install their own, and maybe add a Tesla Powerwall to the system and go off grid. Fewer customers will be available to pay for maintenance of the power grid. It’s a disruptive technology,whereas fusion power maintains the power (literally and figuratively) in the control of large corporations. Solar gives that control to the people. So of course those with the money to invest opt for fusion. But I’m not seeing how it benefits people…just corporations. Is it a solar panel with integrated battery, or a battery with an integrated solar panel? No matter which way you look at it, this new technology being developed at Ohio State is pretty cool. This solar panel has a layer inside that acts as an energy storage medium. No separate charge controllers like an external battery would require. It’s just a solar panel that can continue to supply power once the sun goes down. Since it’s still in the research stage there’s no word on capacity and those details, but it’s a really neat idea that I hope takes off. Read more at ExtremeTech. The fight has begun. Solar and ‘old energy’ are increasingly butting heads, as the old business model breaks in the face of new distributed solar generation. Old energy is fighting back with the help of governments reducing incentives for distributed solar installations and even increasing fees for grid-tied systems. It seems to be slowing down solar adaption in areas, but I think this is just a temporary blip…once energy storage drops in price, people will have a viable solution for going entirely off-grid, and then Old Energy will be faced with the same infrastructure costs, yet with fewer customers to spread that cost over. The inevitable collapse of Old Energy will be fascinating to observe…I can’t wait! Read more at Business Insider. Cool news…using batteries from the gigafactory Tesla is building outside of Reno, Solar City will be including battery backup systems in 100% of the rooftop solar systems they install within 5-10 years. This is significant partly because it helps illustrate the rapidly decreasing costs of both solar panels and battery backup systems, but also because it is likely to have a major impact on our current energy production and distribution systems…the old grid will become obsolete eventually, but the transition won’t be easy for the larger energy companies. Read more at climaterocks.com. 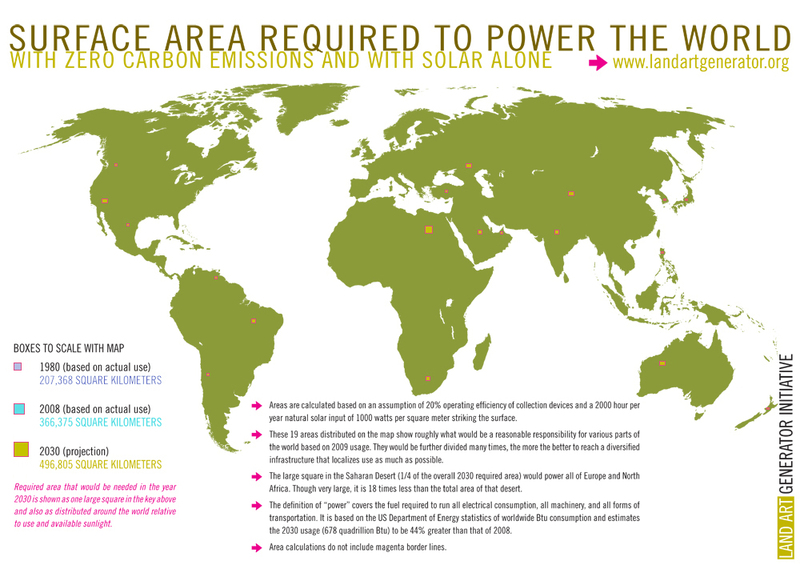 Solar panels take space, but just how much land area would need to be covered with solar panels to provide 100% of this planet’s power needs (including transportation)? The answer is pretty surprising, as the image here shows (click on it for a larger version). It helps show just how much energy the sun is sending our way, and what a small percentage of that is actually required to power our civilization. There’s still a matter of energy storage with solar panels, but I wonder, if long range transmission efficiency could be boosted to the point where we have a global power grid? The sun is always shining on about half the planet…if that power could be transmitted to the dark side of the planet, there would be no need to store electricity. Nikola Tesla suggested that just such a system could be possible. The drawbacks are obvious though…it would be difficult or even impossible to employ Tesla’s system in a way that would allow companies to control who uses that energy. The business model falls apart, sadly, and we live in a world controlled by business and profit.